Tim started learning Handyman work in the neighborhood he grew up in. He found out that all neighborhoods had a variety of handymen. They would let him hold things for them while explaining what & why they were doing it. He is happily married to Julie, his wife of 35 years who encourages and supports Tim. 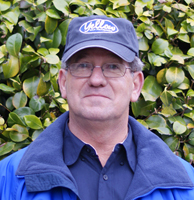 Tim’s favorite past times are woodworking & spending time with family and his new grandchild. Before Purchasing a Yellow Van Handyman Franchise Tim Guffey was employed with GoldToe Brands for 29 years. For 12 of those 29, Tim was their Maintenance Department Manager. He was responsible for a variety of task including the upkeep for their 255,000 sq foot facility and oversaw many employees. From 2008 to 2010 Tim worked for Berkshire Corporation as their Maintenance Manager. He was in charge of setting up, implementing and directing a full maintenance program for them. Now, excited to be in business for himself, but not by himself, Tim looks forward to setting, controlling and adjusting his scheduled as he sees fit. An added luxury that Tim never experienced before working for large corporations will be how simple it will be to spend time with his family, all he’ll have to do is put it on his schedule! Tim’s goal is to have a trustworthy relationship with his members. When they call Tim Guffey with Yellow Van Handyman for service they can rest assured they are getting quality work with integrity at fair market price. Tim knows he can provide this to his members because his service skills are vary from plumbing, electrical, landscaping to general carpentry although his passion lies in woodworking and carpentry. His favorite repairs are building interior projects that show off true skill and cosmetic work when finished. He looks forward to doing many interior projects and cosmetic work because those are the most common requests he receives. Even when it comes to the more unusual requests Tim receives, he is thorough and skilled, once even making an entire house wheelchair friendly per ADA requirements of course! When Tim is referred by one of his members he knows he has met his goal of establishing a trustworthy relationship with that member. The sense of accomplishment he feels comes from knowing he has satisfied their members to the stage where they are comfortable recommending him based on his integrity and skill set. Response: Sandy I am always happy to assist you girl and appreciate that I have you as a friend also. I really value our friendship and sincerely Thank You for allowing me to work for you. My Yellow Van Handyman, Timothy Guffey, did an excellent job on the list I had for him. I will certainly have him back to do any repairs or installations that need doing in my home in the future. I’ve already started another list of household jobs for Tim. Response: Thank You Mrs. Teresa for this kind review and Thank You sincerely for choosing me to work for you. You were a very prepared lady to assist with things already in order and materials for me to go to work as soon as I arrived. Don't think things could go much better that that. I look forward to assisting you again with your to-do-list projects. Excellent skill set, knowledgable, courteous, and honest. Response: Thank You Mrs. Sandy for the kind review. I enjoy working for you and with you. You are very knowledgeable about woodworking in general and understand the process and steps necessary for each task. You are always prepared ahead of time for each project with the right materials to complete. Response: Thank You Mrs. Judy for choosing me to assist you with your handyman request. It was a pleasure to work for you securing the Vinyl Shake Siding on your pretty Mebane Home. I highly recommend YVH and Home Task! Service was very quick and service advisor did an excellent job and it was a reasonable price! Will tell our friends if/when they need a handy man! Response: Thank You Mr. Michael for this kind review. I enjoyed working for you and Mrs Tifnie on your projects. I was also super impressed for what you two are doing hosting exchange students to be able to go to school here. I know they are grateful for your kindness. Tim did a great job! I hope next time I need something, hes the one that does it. He was very nice and very friendly. He got the job done and cleaned up after the job. Its cleaner now than before he got here. I wished they all would take pride in a job like Tim did. I will be calling back for more work later on. Response: Mr. Troy, Thank You, Sir, for the kind words. I really enjoyed assisting you with your projects in Haw River. You are very easy to work for and a joy just to be around. I look forward to being chosen to assist you again, Sir. Very nice person. Repairs exceeded expectations. Response: Mr. Ed. Thank You, Sir, for allowing me to work for you. I enjoyed assisting you with your Entry Door Problem and making repairs to your Wheel Chair Ramp.